1.Remove dirt from the matsutake with a damp cloth or paper towel. Remove the tough end of the stem and slice the matsutake. 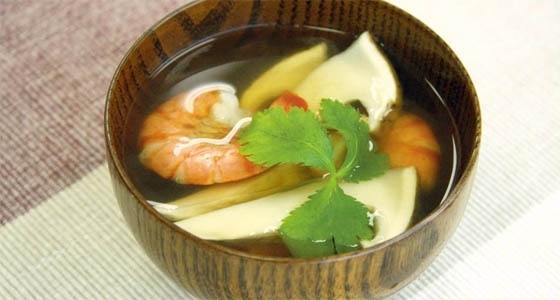 2.Devein the shrimp and marinate in sake before cooking. 3.Combine the dashi ingredients in a pan and bring to a boil. Add shrimp and cook until it boils. Add matsutake and cook quickly. 4.Serve in a bowl with mitsuba on top.